Submitted by Adrian Brown on Wednesday, May 16, 2018 - 22:52. This has been written by the boys at Jupiter Software , and if the game sounds familiar to aged computer freaks - it should be! 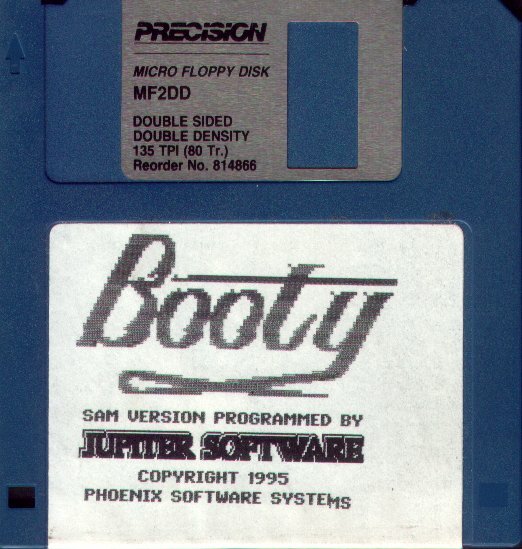 The SAM version is a conversion of the Spectrum classic, Booty, written by John Cain wayback 7 (or so) years ago. The game itself is set on a pirate ship, you playing a cabin hand set to nick all the pirates booty in a strange fit of generousity, and get off the ship! The setup is that of a side on flip-screen platform, with the actual Spectrum version on the same disk! Anyway, it is obvious that the SAM version will benefit more in terms of graphics - and it does! The graphics were produced by Yours Truly, and help make the SAM version a nicer looking one (ahem!). But enough on the self-admiration stakes - the programming is what counts here! And the programmers have done an admirable job producing the set up which is faithful to the Spectrum version. All the touches from the Spectrum game are recreated faithfully on the SAM including animated portholes which capture the "feel" of the sea, and all the rooms of the SAM version match exactly to that of the Spectrum! There are many dangers when collecting treasure on the ship, the first being of course, the pirates! They move along horizontal platforms, swords moving realistically and the speed of them moving is admirable (seeming this was written on SCADs !). Actually, the speed of the whole thing is rather impressive, with no slow down when there is plenty going on. Other dangers include the bombs which are hidden under certain treasure amounts, lifts - which are easier to get on and off than the Spectrum version, affecting the difficulty a tad, and the random dangers of birds and rats which suddenly appear from the edges of the screen and endanger your character. The SAM rat has changed from the Spectrum version, as it has become more intelligent. The Spectrum rat wouldn't appear on screens with lifts, but the SAM rat jumps on the lifts and to lower platforms, increasing the danger! Hmmm, and I must add there is also an extra 10 screens worth of SAM Booty!!! For the amount being asked for Booty, this seems like a runaway bargain - and it is! It plays damn well, with gorge graphics and some addictive game play. The only let-down is the sound effects but it is written on SCADs and you won't notice! Go fetch a copy from Persona now!